Demand for Super Nintendo Entertainment System (SNES) Classic Mini is massive. In over 11 years of tracking hard to find items we have never seen demand so high for pre-orders. This includes the USA where pre-orders went live only last week and sold out in minutes. Nintendo have promised to produce 'considerably' more units than the NES Mini console last year, however based on the current demand we predict there WILL BE major stock shortages. Nintendo have also stated that their priority is production of the Switch console and the SNES Mini is also a limited time production with no more units being produced after 2017. Nintendo have probably decided to manufacture a set amount with some reports suggesting double that of the NES Mini in 2016, however if this is true, this will still not be enough to satisfy demand. So, what can you do if you want one? Firstly, you need to realise that when stock does appear on a retailer website it will likely sell out in minutes! You need to be lightning quick. However with a bit of dedication and using our tips below, we hope to help buy your SNES Classic Mini without too much drama or stress. 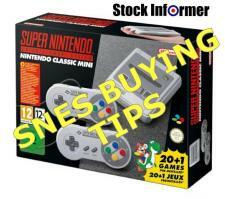 Leave our SNES Mini stock checker webpage open with the alarm option ticked, the webpage will auto refresh itself and sound a loud alarm if stock is found. It's advisable to test the alarm before hand with the link provided. Registered users receive a quicker refresh rate giving an advantage. This will not work on a mobile or tablet. Like our Facebook page and follow our Twitter page for stock alert postings. We will send email alerts if we locate stock. Please bare in mind that emails are not always received or read immediately and therefore not always the quickest of alerts. 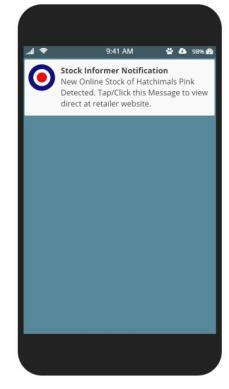 Receive instant notifications of stock on your Android mobile/tablet or desktop PC/MAC. A desktop PC/MAC using the browsers Apple Safari, Google Chrome Web or Mozilla Firefox. We send alerts on a case by case basis. We will NOT send any alerts if the retailer has maybe only one or two units up for sale. In this instance, its pointless sending thousands of notifications as stock will be sold out by the time you read the message which just leads to further frustration. You may read the alert after stock has sold out. It does not mean the notification is wrong, just that unfortunately you are too late in this instance. Your can setup accounts on various retailer websites beforehand and stay logged in. This will save valuable time typing in your name and address and other details when you want to order quickly. 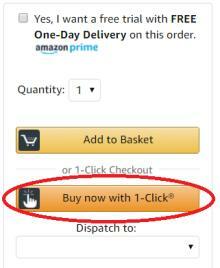 If you have an Amazon account, you can login and turn on '1-Click' ordering. This means you can immediately order without having to enter all your login details etc. When stock appears on the Amazon website, you just have to click the "Buy it now with 1-Click" button on the right-hand side of the page. Warning - Ensure Amazon actually has stock at the time (i.e. dispatched and sold by Amazon.co.uk). Otherwise you could end up ordering from a 3rd Party Seller at a higher price. If this happens, you can always login to your account details and immediately cancel the order anyway. This may sound obvious, but have your credit/debit card details to hand. This can save valuable time at the checkout process. 8 - Set your Alarm Early! A few Retailers (Tesco Direct to name just one), often release stock overnight to ease the likelihood of a mass influx of visitors to their website all at once. Therefore, it sometimes pays to check first thing when you wake up. We also know that quite a few of our users will sleep with a laptop on next their bed with the alarm feature enabled! We also track for stock at Amazon Germany, Amazon France and Amazon Spain (Amazon Italy will not currently deliver the SNES to the UK). You can use your existing Amazon UK login details and place an order. The SNES Classic console is the same wherever you buy in Europe. It doesn't come with a traditional UK plug and transformer, you basically need to use a spare mobile phone charger and lead you may have lying around in a drawer somewhere. If you don't speak the language, the Amazon Germany website provides an English translation, just click the Globe drop down list on the menu bar and select English for a fully translated website. For other websites if you are using the Google Chrome browser, just right click and select 'Translate to English' or you can copy and paste text into Google Translate. Over the years we have helped thousands order by this method for different products and have only had positive feedback. The SNES Mini launch day is Friday 29th September 2017. If possible, stay up late on the Thursday night to be ready at midnight! Retailers have been known to add stock just after midnight. Also, throughout Friday it's adviseable to keep an especially close eye on proceedings as stock can appear at any time. Using all of the tips above or just a combination will help your chances of hopefully bagging a SNES Mini this Christmas. Good luck and if we manage to help you please us know and also share with your friends!